Hachiman is one of the playable Gods in SMITE. Pregnant with her unborn son, Hachiman, the Empress Jingu led a fierce campaign against the forces that slew her husband. Fearing her child's birth would slow the army's advance, she tied bandages about her belly and held him within for 3 years, until the war was done. Each day, she prayed she would not lose the child, that he would be born strong. That he would be a God. As 8 banners descended from heaven, heralding his birth, her prayers were answered. Even in this, a war between Gods, Hachiman will retain his code. It is the humanity of the Gods that appeals to mortals, that makes them love and worship him. 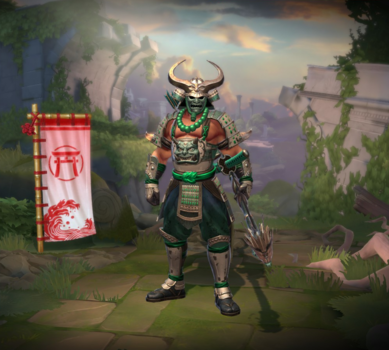 Should Hachiman lose even that, then he is no warrior. He is only war. This skin could only be obtained by accumulating 63000 Odyssey points in the Odyssey 2018 event. Decreased Damage from 85/140/195/250/305 to 75/130/185/240/295. Decreased Slow from 25/30/35/40/45% to 20/25/30/35/40%. Ammo increased from 3/3/3/4/4 to 3/3/4/4/4. Damage reduced from 10/15/20/20/25 and 0/5/10/10/15 to 10/15/15/20/25 and 0/5/5/10/15. Cooldown reduced from 18/18/17/17/16s to 16s. Damage Adjusted from 225/285/335/390/445 to 225/280/335/390/445. Corrected Hachiman's passive meter numbers, and fixed an issue where Hachiman's passive didn't give per-level bonus MP5. Fixed Hachiman's basic attacks using wrong FX after being stunned while toggling Eagle Eye. Fixed UI - doesn't blink while toggled on. Fixed Iaijutsu highlighting enemies way outside the targeter from certain angles. Hachiman has been added to the game.